With the timing of the latest G20 meeting set to coincide with the run-in to the German elections acrimonious debate has not been absent, but even as the passions generated by the arrival of voting day subside, it is clear that just beneath the surface their lie some simmering problems which simply will not go away. Despite the fact that nothing is really on the table that will make that much difference in the short run, I think the structural transformation that they are carrying out at G20 level is going to be very important in the longer term in finding eventual solutions. According to Bertrand Benoit in the Financial Times the G20: “will endorse a report from the Financial Stability Board that calls for bonuses to be linked to the long-term success of financial companies and not excessive risk taking.” Well this of course sounds absolutely fine. I have absolutely no objection, but we need to understand that from a macro economic point of view it is virtually irrelevant, with the added detail that the implications are that a recovery in growth will be slower yet less risky. Evidently the issue of why there has been so much liquidity floating around (and this has been the heart of the problem) has little to do with bank bonuses and salaries. Having interest rates near zero in a significant part of the developed world for an extended period of time – the inevitable consequence of having such a huge excess in global savings – means the the money will still be there, very cheaply, for people to do just whatever they want with it. They might, for example, like to buy Hungarian forint denominated assets, as Deutsche Bank analysts have been advising them to do, and try to find out just how long it takes them to push the economy of that small country right off the edge of the precipice on which it is presently so perilously perched. Or they might like to do something similar with the Russian Ruble, and see if they can block Bank Rossii from being able to move towards a floating currency. Or, if they are really short of interesting ideas, they might like to buy the South African Rand to see just how far out of line you can push the currency in a country which is suffering its worst recession in a couple of decades. Of course, all of this is not that risky for those who understand the finer arts of Forex trading, and the banks who lend them the money will run little risk. The risk here is for the poor people who live in Hungary’s and South Africa’s of this world. Risk in these cases is, of course, massive. The banks are also being pressurised to raise their capital ratios. While this is always well-advised in the boom times, it only makes matters worse in a downturn. The current drive to make banks less leveraged and safer may well have the perverse consequence of reducing money balances in the short term. At least this is what Tim Congdon from International Monetary Research argues. This process simply “strengthens the deflationary forces in the world economy, and that increases the risks of a double-dip recession in 2010,” he says. Meanwhile everyone will continue to drive full speed ahead on open ended stimulus programmes, without being altogether clear what it is they are trying to stimulate (see the Spanish case if you don’t believe me). “The G20 will call for extraordinary fiscal and monetary stimulus to be continued until â€œa durable recovery is securedâ€”. But, and here comes the rub, it will also call on countries to act together to ensure more balanced economic growth in future, with surplus countries â€“ China, Germany, Japan and oil exporters â€“ urged to raise domestic demand and deficit countries asked to reduce budget and trade deficits once the world has secured a recovery. This is evidently the sensitive point which has had everyone from Peer SteinbrÃ¼ck and Angela Merkel, to the newly elected members of the DJP in Japan and the governing elite in China twitching away furiously in recent days. The leaders of these countries have become nervous, since they feel they are being blamed for something they haven’t done, and naturally they are lashing back. They need not worry so much, these exhortations will also be to no real avail. In order to see why, let’s take a quick tour through the real heart of the problem. According to the current director of the US presidentâ€™s National Economic Council, Larry Summers, writing in an academic paper published in 1990, the United States economy was set to run current account deficits for a period of 15 years, with the consequence that more than 6 percent of U.S. assets would be owned by foreigners by 2010. However, as he saw it, high saving during the subsequent 15 years would result in the generation of current account surpluses and a reduction in foreign capital ownership to 3.5 percent. After 2025, or so the analysis ran, the rapid increase in the number of elderly, would once again lead the United States to run current account deficits. Since this forecast seems to come so near to describing a process we are now seeing unfolding before our very eyes â€“ in a world where many hold economists can see nothing at all coming â€“ we might like to ask ourselves how anyone could have known so much so far in advance? The answer to this strange questioin is Larry Summers used a very simple model to arrive at his â€œpredictionsâ€, a model based on the life cycle saving and borrowing mechanism, the description of which was to lead Italian economist Franco Modigliani to win a Nobel in 1995. Summers and his co-authors simply applied the individual Life Cycle model to a whole population, and as it appears came up with a fairly plausible outcome. Everyone is evidently only too well aware that all developed societies are ageing (some, of course, more rapidly than others), but what many observers do not seem to grasp is that this ageing process has very concrete and forseeable economic consequences, consequences which have now been captured in a whole generation of economic models, and which are described in the accompanying chart prepared by my colleague Claus Vistesen. As can be seen from the chart, as the demographic transition â€“ identified in age bands following the nomenclature of the Swedish demographer Bo Malmberg – advances median population ages move steadily upwards, producing in their wake a whole series of economic phenomena, phenomena which tend to impact directly on the domestic consumption and the current account balance of a national economy. The thick blue line shows what happens to the current account as a given country moves through the age bands. Initially there is a tendency to sharp deficits and severe economic crises, such as are very characteristic of low income, high fertility, developing economies like Ecuador or Pakistan. Then, as societies develop socially and economically the tendency toward deficit remains, only this time on a more mature, and seemingly more stable, basis as seen most evidently in recent years in countries like the United States, the United Kingdom, Spain and France, who all have population median ages in the 35 to 40 range. But then something strange happens as population median ages rise past the 40 mark, and especially as they age past 42. The current account suddenly swings into the positive zone, and this can be seen in the real world in countries like Germany, Japan and Sweden, where the ageing population effect means that domestic consumption becomes steadily weaker, and if we look at the second (purple) line in the chart, which illustrates the level of export dependency, we can see that while this is weak at the lower median age ranges (due to the momentum derived from stronger domestic-credit boom dynamics), it steadily grows at the higher median ages. So, is there any empirical evidence for this phenomenon you may ask? Well just look at Germany, Japan and Sweden, and how the recent collapse in demand for their exports produced by the global crisis sent the economies in these countries spiralling downwards. On the other hand, during periods of economic boom, strong surplus countries need to find an outlet for the savings they accumulate. Hence the large current account deficit countries in the East of Europe, for example, were funded by Austrian, Swedish and German banks. The question we should be asking is not why banks in these countries were so stupid as to lose so much money, rather it is why they had so much money to lose in the first place. That is, why were their populations saving so much, and why were profitable domestic outlets for such savings insufficient? Once we can get hold of this, we can start to see one of the reasons why there have been such large global imbalances in the first place. 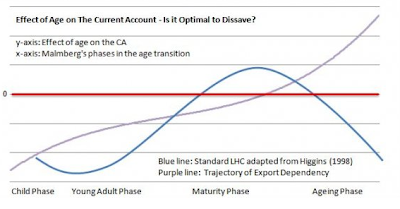 One of the problematic aspects of this situation, looking at the chart, is there there is no steady state (or cyclical correction) mechanism at work here, since there is not, to use the jargon, homeostatis, and the need to export (the export dependency purple line) simple heads off exponentially towards infinity, while the level of deficit does the same in the opposite direction. The reason that the need to export moves exponentially upwards is that median age doesnâ€™t just move up from one level to another, and sit there, but keeps climbing steadily upwards, and the more it rises, the less â€œbang for the buckâ€ in GDP growth you get from any given level of exports. This is the situation we are seeing now in Germany and Japan, and this is why they will struggle mightily to pull themselves out of the present recession, and why the whole situation is evidently not sustainable. So, if the countries in question donâ€™t do something, and do something now, to stop median ages rising too rapidly, more crises like the one we are presently living through are evidently guaranteed. This way of thinking about things is sure to form, in my opinion, one piece in the new, post-crisis, macro mindset that will emerge. Of this I have no doubt, since the present crisis is all about imbalances, and this is one simple and straightforward model for thinking about and understanding them. Basically one group of people – the current account surplus countries (China, Japan, Germany, Sweden) – were afloat with money, and spent their time rather recklessly lending it to another group of people – the current account deficit crowd ( the United States, Iceland, Ireland, the UK, Spain, Portugal, Greece, Romania, Bulgaria, the Baltics, Hungary and New Zealand etc, etc) – who needed to fund their deficit habit, and who did so by equally recklessly borrowing the money. So if you want to understand the banking crisis, you need, as the US economist Brad Setser would say, to follow the money and find source of all those surpluses and deficits. As Freeland highlighted, on this possibility, Summers was absolutely bullish, and understandably so. â€œThe very great enthusiasm for accumulating reserves that one saw globally is likely to be a smaller factor over the next decade than it has been in recent yearsâ€ he predicts this time. And so too is economic growth (going to be a smaller factor over the next decade), Edward Hugh rapidly adds, since with everyone looking to export their way out of trouble, we have to ask, as Nobel Economist Paul Krugman pointed out, the tricky question about just who the customers with the current account deficits are now going to be to enable all those much needed exports. The current talk of a simple and straightforward recovery for the global economy is misleading, and a long hard road lies ahead for all of us. And the first evidence of this can be found in the latest quarterly US current account data. The deficit narrowed in the second quarter to $98.8 billion, the lowest level since 2001, reflecting a smaller shortfall in trade of goods as imports and exports both decreased. This is far from being a linear process, and the U.S. trade deficit was up again in July, rising 16.3% over June to hit $32.0 billion, according to Commerce Department data. Despite the fact that imports rose sharply in July on the back of the stimulus programme, total trade activity is still well below last year’s level, and the trade deficit with China was $20.42 billion compared with $25.01 billion in July 2008. In addition US bank loans have been falling fast, and were down at an annual pace of almost 14% in the three months to August (from $7,147bn to $6,886bn). The M3 “broad” money supply, watched as an early warning signal of where the economy will be a year or so later, has been falling at a 5% annual rate. There is absolutely no sign of an imminent sharp rebound in US domestic demand, and little likelihood of a continuing strong current account deficit. The most likely path is for the deficit to steadily close of its own accord as the stimulus programem which is still supporting it is steadily withdrawn. Well, this is what the world wanted, and this is what it is now going to get. So everyone should be happy, I guess. And while the deficit countries close them down, there is little liklihood of the surplus countries taking their place. It is like telling these countries, you know, you really should have had more children 30 years ago. Do people really think these countries can simply invent policies at the snap of a finger and convince citizens who are worried about the stability of their pension system to spend more now, just because it is in the interest of the global economic system? And what policies exactly. Buy one and get another one for free from the central bank? But coming back to the G20, as I said at the outset, what I think really matters at this point is that our policymakers have set up a problem for themselves to solve, and they have also set up a structure through which they may solve it. And that is something. Now in all likelihood we will continue to thrash around trying-out false solutions for the next two or three years, but then maybe, just maybe, they will all be ready to talk about what we really might do. And here’s the good news, there is another planet out there waiting to be exported to. And the planet has a name – the Emerging Economies. So all we have to do now is work out is a sensible and responsible framework (the so called “supportive environment”) through which cheap credit can be channeled into these countries, without that is producing the kind of boom-busts we just saw in the Baltics, Romania and Bulgaria. Not a little task, but not an impossible one either. (1) An Aging Society: Opportunityor Challenge? – written with David M. Cutler (Massachusetts Institute of Technology), James M. Poterba (Massachusetts Institute of Technology), and Loise M. Sheiner (Harvard University) and published in Brookings Papers On Economic Activity, 1990. However, one new issue, which went probably unmentioned at the West. With the extreme wage fall in Latvia suddenly it turns out that such a relict in Europe as textiles industry becomes competitive globally. This went not unnoticed by major exporters because officials from European Commission started suddenly spurt towards Latvia with an aim to check if there is not too much support for textiles industry (which in reality is absent). Latvia is so small, however, generally here can emerge a serious West-Ost conflict in the European Union. Because it is seriously questioning established global work-sharing. Like China purchases German machinery and French perfumes, and vice versa they purchase all shirts and bras from China. Letâ€™s see. But these last very profound activities from EU were viewed in Latvia as totally strange.